Faiez Serraj in his capacity as the PC’s Commander-in-Chief dissolves the 33rd Infantry Brigade led by Bashir Khalfalla ”Bugra” (Source: PC).. 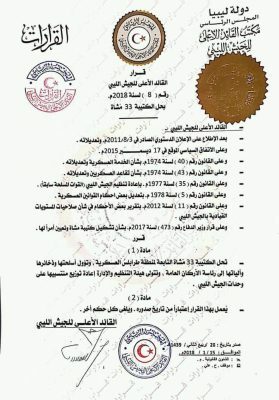 The Faiez Serraj led Presidency Council (PC) declared a local state of emergency around Tripoli’s Mitiga airport today after a coalition of militias aligned to it successfully repelled an attack on the airport compound. 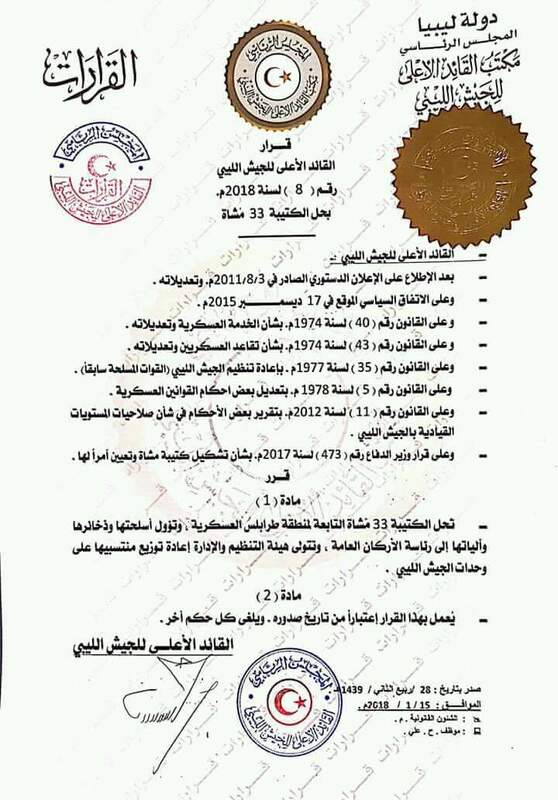 Early this morning the 33rd Infantry Brigade, a militia recognised by the PC’s Ministry of Defence led by Bashir Khalfallah, more commonly known by his nicknamed Al-Bugra (“the cow”) attacked Mitiga with about 50 armed vehicles. Small arms, heavy weapons and artillery were used by both sides in clashes that lasted for about three hours. The assailants were believed to have gained a brief entry to the compound from the rear Tajura gate. Precise casualty figures are unclear, with some reports saying as many as 15 people had been killed and at least 37 injured. However, the fighting has now stopped and Bugra’s militia has been pushed back to the outskirts of Tajoura where they are being pursued. As the assault developed, Rada was supported by at least 10 other PC-aligned brigades, including the more prominent Haithem Tajouri’s Tripoli Revolutionaries Brigade, Abdul Ghani Al-Kikli’s (“Ghneiwa”) Abu Sleem Central Security Force and the Nawasi Brigade. Retribution has been swift by the pro-PC forces, with Rada spokesman Ahmed Ben Salem telling the Libya Herald it “was impossible to count” how many had been arrested. He added that at no time did the Bugra fighters enter Mitiga airport, though Ben Salem said three planes had been damaged. Afriqiyah Airways announced two of its planes had been hit and that it was cancelling flights for the next three days until the situation became clearer. Some planes took advantage of the lull in fighting by taking off to seek safety elsewhere before flights were suspended. Some homes near the airport also sustained damage. In a statement the PC decried the attack and said it was an attempt to release ‘‘terrorists…such as IS and Al-Qaeda and others’’ from detention. The others could include members of the BDB and Benghazi Shura Council. They criticised spoiler efforts to endanger the stability of Tripoli and the Libyan political transition process. The PC applauded the cohesion of the forces supporting it in responding to the threat by the Bugra militia.